MARY TERRONEZ, I.D. 812494 5315 W. River Dr. Davenport, Iowa 52802 October 24, 1976 ADDITIONAL WORK EXPERIENCE SINCE MY SEPT, 9 , 1975 APPLICATION: 1. Scott County Department of Social Service 7/2/75 to 9/2/76. Worked 60 day emergency employment program. Duties included telephone and personal contact with persons applying for food stamps. Scheduled and logged food stamp appointments, filed and performed clerical duties. 2. League of United Latin American Citizens (L.U.L.A.C.) Elderly Nutrition Program, Davenport, Iowa 9/5/75 to 3/5/76. Worked as Outreach Worker. Duties consisted of the following: Interpreted for elderly Spanish speaking; recruited persons for the elderly nutrition program; furnished transportation and English interpretation for Spanish-speaking elderly when attending medical appointments, dental appointments, legal aide staff, welfare appointments, or other agencies. 3. Scott County Department of Social Service, Davenport, Iowa, 7/23/76 to 9/23/76. Worked as Income Maintenance Worker I Trainee in a 60 day emergency employment program. Duties included: interviewing Aid to Dependent Children clients and food stamp clients during their six months review; calculated amount of food stamps to be issued; determine amount of A.D.C. grant; determined if clients were still eligible after reviewing any change in family income and composition; received training in policy and procedures for the different guidelines for the A.D.C. and food stamps, and annotated necessary changes in pertinent manuals. 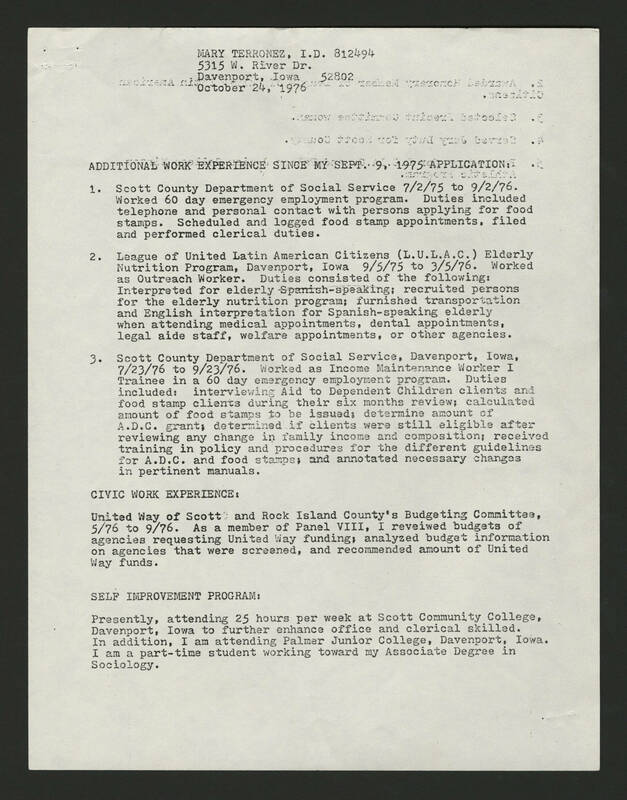 CIVIC WORK EXPERIENCE: United Way of Scott and Rock Island County's Budgeting Committee, 5/76 to 9/76. As a member of Panel VIII, I reveiwed budgets of agencies requesting United Way funding, analyzed budget information on agencies that were screened, and recommended amount of United Way funds. SELF IMPROVEMENT PROGRAM: Presently, attending 25 hours per week at Scott Community College, Davenport, Iowa to further enhance office and clerical skilled. In addition, I am attending Palmer Junior College, Davenport, Iowa. I am a part-time student working toward my Associate Degree in Sociology.